He can't. Few can. Even I can't. How did it come to this? It's a sad tale that I've seen repeated several times in our virtual world: people with very awkward names. But why do they occur? I will tell the story of how my name came to be, and then to pronounce it. I'm a very inquisitive person and I love to try new things, especially online services. 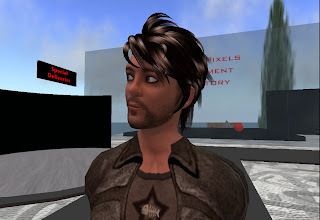 I'd heard about the Second Life Virtual World™ and how people were apparently making millions living in a virtual paradise. Finally I obtained a computer sufficiently powerful to enable me to try it. As I do with any new online service that I happen to test (and I test an awful lot of services), I use a throw-away id. I don't use my real name unless it's a serious service, which at the time I did not believe SL to be. The trouble was I couldn't figure out SL right away. Usually you can jump into a service and determine how it works within a few days or even hours. Not SL. Not with its steep learning curve and deeply rich culture. So I continued slogging along as a pathetic newb for days, learning the ropes. Weeks passed. Then months. At that point, I had grown virtual legs and was finally capable of operating competently. But something else had happened. I was connected. I had a reputation, friends, stores, and even a pretty serious blog. It was too late to change my name without losing a ton of social capital. So here I am, with my awkward name. I sympathize with others who also made a mistake when they signed up, especially those unfortunates with digits attached to their first name. ArminasX should be pronounced as "Ar-min-AXE"
Just consider the "s" to be silent. Or even better, just call me "Armi". Should I get a new avatar with a new name? No, it's far too late for that. But I do have some thoughts on the qualities that make a good name. But let's save that for another day. OMG - I have the same troubles. I should have picked a plain spelling for my name, like 'Timory'. I'm vindicated!! Even Armadillo... er... Alfred.. er... THAT GUY! can't pronounce his own name!!! BTW, trying to use OpenID and Wordpress authentication to post comments on blogger.com blogs always fails. It tells me I need to sign in to wordpress even though I already am. Fortunately I picked a name that popped into my head and it is useable. I had no idea we would be stuck with them either. I am glad I wasn't feeling clever that day!! How Cool Is Your Avatar's Name? 6 Ways To Run Your Business After You Die!